Does working with children’s feelings improve their academic performance? Scientists at the Institute of HeartMath (IHM) in Boulder Creek, California are studying the effects of positive feelings such as love, compassion, and kindness on our bodies and brains. Their findings suggest that mental performance improves in the presence of positive feelings. Deliberately focusing attention in the heart while cultivating feelings of love, compassion, etc., leads to clearer thinking, calmer emotions, and improved physical performance and health. Negative emotions such as anger, fear, and hatred make the heart change speeds erratically. The heartbeat literally speeds up and slows down chaotically between beats, like the random, jerky motion of a car that’s running out of gas. 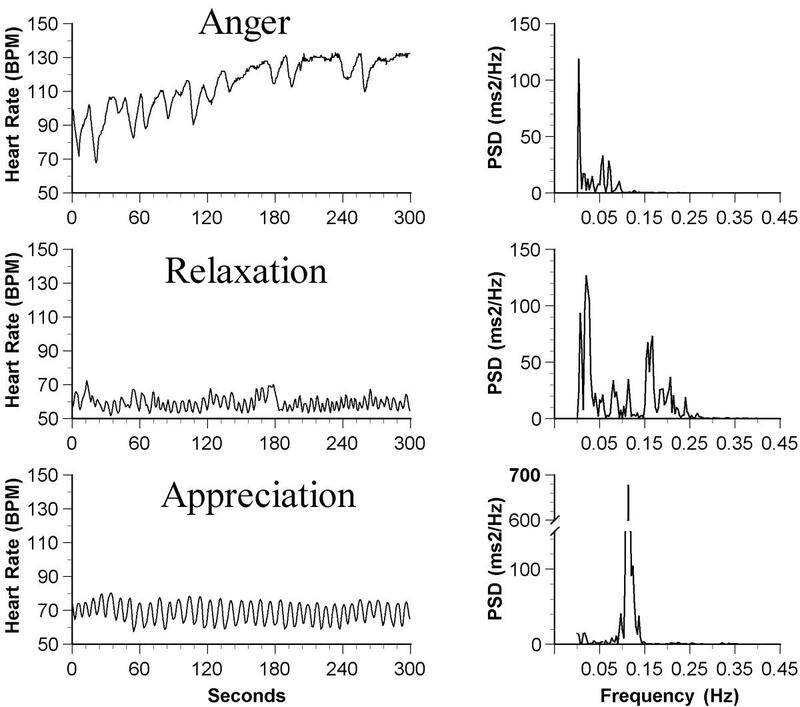 In the figure below, the charts on the left show graphs of heart rate variability during positive, negative, and neutral emotions. The figures on the right show the heart’s electrical power output (PSD: power spectral density). Note that the heart’s power output is approximately 380 percent higher during feelings of appreciation than during simple relaxation. To summarize: positive, harmonious feelings enhance mental focus, calmness, health, performance, and the frequency of spiritual feelings. They increase relaxation, alpha-wave output in the brain (associated with a calm, meditative state), and synchronize heart-rhythm patterns, respiratory rhythms, and blood pressure oscillations. Whether our goal is peak performance in the classroom, in sports, or at work, it’s clear that cultivating positive feelings facilitates success. Additional evidence suggests that feeling and reason work together, and that one without the other isn’t trustworthy. Roughly 70 years ago, researchers first became aware that the prefrontal cortex of the brain is the area where important human qualities are localized, such as concentration positive attitudes, optimism, and the ability to form goals and persevere in attaining them. The prefrontal cortex is also the “control center” where raw emotions are restrained and modulated. In a number of spiritual paths, the primary meditative practices include holding attention gently in the prefrontal cortex, at the point between the eyebrows, a technique these traditions claim has a harmonizing effect on the emotions, and calms and focuses the mind. Richard J. Davidson, PhD, director of the Laboratory for Affective Neuroscience at the University of Wisconsin, found that university students who had higher levels of activity in the prefrontal cortex had better grades, a better ability to create and attain goals, and less trouble with depression, drugs, and alcohol. In 2002, scientists at Duke University used brain scans to verify that raw emotions interfere with concentration. A surprising finding was that mental focus and unrefined emotions exist in a mutually exclusive relationship. That is, not only does raw emotion distort our ability to focus, but deliberately focusing attention is an effective way to calm and “neutralize” disruptive emotions. As the Duke news release stated, “Surprisingly, an increase in one type of function is accompanied by a noticeable decrease in the other.” Athletes know that an effective way to calm the “pre-event jitters” is to focus deliberately on the details of preparation: tying shoelaces, mentally reviewing the race plan, etc. People who meditate find that holding attention persistently but with relaxation in the area of the anterior cingulate (at the point between the eyebrows) more or less automatically soothes any troubling emotions they might be feeling, and helps them become more calm, positive, and concentrated. Raw, reactive emotions have a very different mental and physiological impact than calm, positive feelings. 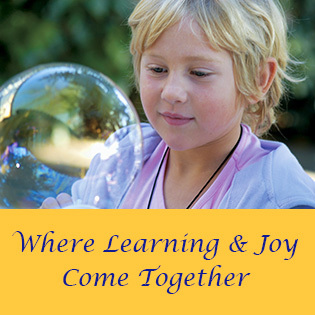 At Living Wisdom School, the children are encouraged to be honest about their feelings, but they are also taught ways to transmute negative feelings into positive ones. For example, one technique involves deliberately focusing attention as a way to calm upset emotions, which can lead to painful disharmony and poor academic performance. As an aid to concentration, the children learn a simple meditation technique borrowed from yoga, which involves holding attention gently in the prefrontal cortex, as a way to help the mind become relaxed and one-pointed – an asset for children who want to be happy and do well in school. As noted above, researchers now know that feeling and reason work hand in hand. Contrary to a longstanding prejudice of western culture, which assumes that reason is the superior faculty, researchers have found that reason is deeply compromised unless it is balanced by the feelings of the heart. 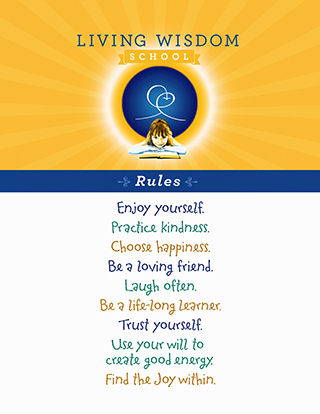 In summary, the Heartmath research suggests that teaching students how to cultivate positive feelings increases their nervous system harmony, thereby improving emotional stability, cognitive functioning, and academic performance. The results of these studies come as no surprise to the teachers at Living Wisdom School, where students have learned techniques for harmonizing the heart for more than 30 years. Asked whether the emphasis on developing children’s feelings detracts from their academic performance, school director Helen Purcell points to the results: the students score consistently above average on standardized tests of academic achievement. 2 Daniel Goleman, Emotional Intelligence. New York: Bantam Books, 1997. pp. 27-28. 4 McCraty R, Atkinson M, Tomasino D, Goelitz J, Mayrovitz HN. The impact of an emotional self-management skills course on psychosocial functioning and autonomic recovery to stress in middle school children. Integrative Physiological and Behavioral Science 1999;34(4):246-268. Ten Questions: 10. Are You Truly Nonsectarian?